Notre Dame consistently ranks in the top 20 schools in the country, according to U.S. News & World Report, The Princeton Review, and Forbes. of incoming first-year students live on campus. Broad alumni network (alumni clubs domestic and abroad) helping with career advancement, mentoring, and support. 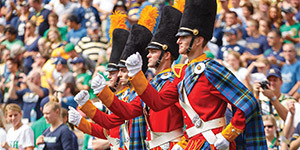 If you’re interested in becoming a part of the Notre Dame community and would like to get some more information, visit our admission website at admissions.nd.edu. Staying on the forefront of education takes constant innovation. That’s why we expose students to a variety of disciplines, from arts to sociology to the sciences. We develop not only intellect but the well-rounded character needed to solve today’s challenging problems. And with a culture grounded in the Catholic values of service and respect for humanity, our students learn to live life with meaning and purpose. While conventional wisdom has advanced the world to where it is today, it’s the conviction to shape and reshape those conventions that will continue our progress into the future. We believe a rewarding education should do more than just teach—it should facilitate learning. At Notre Dame, you’ll develop powers of discernment that allow you to discover the right questions, not just the right answers. You’ll benefit from powerful resources and state-of-the-art research facilities—like our research-class telescope, a Digital Visualization Theater where you can explore the edge of the observable universe on a 50-foot-wide dome, or solar filters that allow for examination of the sun. It is this process of intellectual engagement that will help you find your true calling in life then apply it to the world. “I came here as a young man and dreamed of building a great university in honor of Our Lady, but I built it too small, and she had to burn it to the ground to make the point. So, tomorrow, as soon as the bricks cool, we will rebuild it, bigger and better than ever.” These are the words of Notre Dame founder Father Edward Sorin in 1879 after a fire had virtually burned down the entire University. These words echo the role of Catholicism at Notre Dame; rather than being a miniscule part of our experience, it should be built as a grand gesture of hope, reverence, and examination. We challenge students to search for unconventional answers and consider their wider role in the world. While our traditions are founded in Catholicism, we welcome all religions, beliefs, and ideas in the spirit of mutual respect. Discovering your faith is a personal experience, but at Notre Dame, you’ll never be alone in it. As a Catholic institution of research and scholarship, we believe in examining our faith, studies, and community from all angles. That’s why we embrace an atmosphere of diversity and inclusion that enriches all facets of the Notre Dame experience. Our 30 unique residence halls reflect this commitment to solidarity, showing how a diverse group of individuals can become one tight-knit community. Years after you leave Notre Dame, you’ll continue to draw upon the unique relationships and connections you’ve developed at Notre Dame. Whether it’s maintaining friendships with your freshman roommates or engaging in a conversation with a stranger wearing the Blue & Gold, you’ll be a Domer for the rest of your life. We understand to get the most out of your studies, you have to enjoy your life outside of them. That’s why our students participate in activities that bring the campus community together, like the annual Muddy Sunday volleyball game for charity or the Hammes Notre Dame Bookstore Basketball Tournament, the largest outdoor five-on-five basketball tournament in the world. We encourage you to get out and experience all we have to offer, no matter your interests and passions. The experience and perspective you gain is as important to developing your character as the lessons you learn in the classroom. The value of a Notre Dame education isn’t determined by a challenging curriculum. It comes from giving students the intrepid spirit to make ethical decisions with conviction. You’ll explore a variety of topics and issues, giving you a better understanding of the world around you. And with 95% of our students graduating on time, the confidence we impart shows in both their character and performance. 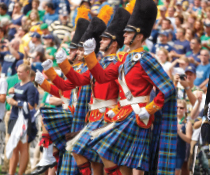 Notre Dame also has one of the widest and most influential alumni networks in the world. It’s one of the reasons that 98% of our graduates find career opportunities within six months of graduation. At Notre Dame, we believe real value is four years of education that lasts a lifetime.